Where can you stream Maniac? On 2018-09-21 Comedy/Drama TV Series Maniac first aired on Netflix. 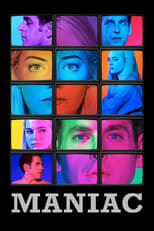 Written and created by Patrick Somerville & Cary Joji Fukunaga, and produced by Anonymous Content & Paramount Television, Maniac has ended and last broadcasted on 2018-09-21.